At the beginning of World War II, Hong Kong was a British possession on the south-west coast of China to the south-east of Canton in the Pearl River estuary. The Chinese had ceded Victoria island to the UK at the end of the 1st Opium War (1839/42), and the New Territories on the mainland were administered by the British from 1898 under the terms of a 99-year lease. The British created the city of Victoria on the north-west coast of Victoria Island, and Kowloon was developed across from Victoria on the mainland. By 1941, the colony’s strategic position was exposed and vulnerable. Among other things, the colony was sited on a particularly rugged section of the coast with only 13% of the land suitable for farming, so food constituted some 25% of all imports; Victoria Island’s water was supplied by a complex system of catchment basins and reservoirs and the population had been swollen by refugees from the 2nd Sino-Japanese War (1937/45) on the Chinese mainland. In June 1940, the colonial administration had ordered the evacuation of all European women and children, but a considerable number of the former evaded the order by enrolling as nurses, air raid wardens and clerks. Hong Kong had also become a haven for Kuomintang (Chinese nationalist) smugglers, who used the cover provided by the large fishing fleet to move as much as 6,000 tons of munitions per month to the Chinese interior. Hong Kong’s defences included coastal artillery batteries on Stonecutters Island, Mount Davis, Jubilee, Devil’s Peak, and Pakshawan. The naval base was located at Aberdeen on the south coast, where it was protected from the mainland by the mountains of Victoria Island and sheltered from the sea by Aberdeen Island. The air force had to share facilities with the Kai Tak civilian airfield. The core of the colony’s land defences was provided by the Gin Drinkers Line, named for the fact that its western end was anchored on Gin Drinkers Bay. The line comprised a series of pillboxes and connecting tunnels along the ridges in the area to the north of Kowloon. Work on the establishment of the line had begun in 1937, following the Shanghai Incident (a conflict between China and Japan in Shanghai before the start of the 2nd Sino-Japanese War), and lasted two years. The key to the Gin Drinkers Line was the Shing Mun Redoubt, which covered a gap in the hills through which any attacker would try to descend on Kowloon. Shortly before war broke out, some 34 ships in the harbour were ordered to depart, but seven had not yet done so by the time news of the Japanese ‘Ai’ attack on Pearl Harbor reached the colony. The British prime minister, Winston Churchill, had been minded to write off Hong Kong as the situation in Asia and the Pacific deteriorated, but for reasons of national prestige the British ultimately decided to defend the colony. Pairs of British, Indian and Canadian battalions were sent to join to the garrison, which had up to this time comprised a militia brigade. The British and Indian battalions were well trained, but had all lost many of their best officers, non-commissioned officers and men as cadres for new units. 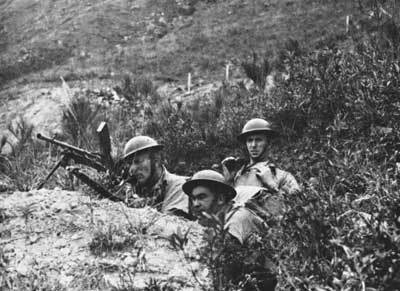 The Canadian battalions had previously been assigned as guards at prisoner of war camps and to other garrison duty, and were neither well trained nor well equipped, and were further degraded in capability when they were fleshed out with raw recruits just before departing for Hong Kong. The garrison had 58 pieces of artillery into five batteries, but air strength took the form of a mere three totally obsolete Vickers Vildebeest torpedo bombers and two obsolete Supermarine Walrus reconnaissance amphibians at Kai Tak, and local naval forces were built around Thanet, Scout and Stronghold, which were obsolete destroyers. The Japanese allocated the task of taking Hong Kong to Lieutenant General Tadayoshi Sano’s 38th Division, part of Lieutenant General Takashi Sakai’s 23rd Army. A veteran formation, the 38th Division had some 20,000 strong and, by Japanese standards, were well supplied with motor transport and could call on the support from nearly 100 aircraft based at Tien Flo air base outside Canton. A flotilla of light warships from the China Area Fleet was assigned to enforce a sea blockade. The Japanese commanders had accurate intelligence on the latest British dispositions from Japanese agents operating across the border and from information bought from Triad agents in Kowloon and Victoria. The British commander, Major General C. M. Maltby, was badly misled by his intelligence staff about Japanese capabilities and intentions. Maltby’s head of intelligence was well experienced, but while visiting Japanese officers across the border seems to have been fed disinformation that the Japanese had no plan to attack the British. Reports that up to three divisions of Japanese troops were massing across the border were discounted. However, this intelligence lapse was of no great consequence, since sightings of a Japanese convoy off Saigon in French Indo-China prompted Maltby to alert his forces the day before war broke out. It was at 06.00 on 8 December 1941, four hours after the attack on Pearl Harbor, that the Japanese crossed the frontier. Their leading elements advanced 4 miles (6.4 km) before meeting elements of an engineer and infantry covering force which had been instructed to demolish bridges and otherwise delay the Japanese. Maltby knew the frontier was indefensible with just three battalions, and therefore planned to make the Gin Drinkers Line his main line of resistance on the mainland, but even this shorter line was badly undermanned. A staff study in 1937 had estimated that two divisions (18 battalions with a full complement of supporting arms) would be required to hold the Gin Drinkers Line, but Maltby had only three battalions available for this task, and the key Shing Mun Redoubt was held by a mere 42 men. The two Canadian battalions were deployed on Victoria Island against the possibility of a landing on the south coast, while the 1/Middlesex Regiment, a machine gun unit, manned the island’s pillboxes. There was no reserve to counterattack any penetration of the Gin Drinkers Line. Japanese aircraft attacked Kai Tak at 08.00, destroying four of the five RAF aircraft on the ground, and also eight of the 13 Douglas DC-2 civilian aircraft. The 38th Division was well supplied with bridging equipment, so its infantry needed only two days to reach the Gin Drinkers Line, despite the demolitions. 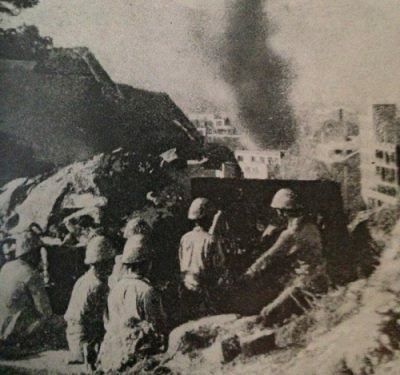 However, the latter were more successful in delaying the arrival of the Japanese formation’s artillery, which was therefore not available to support the initial attacks on the Shing Mun Redoubt. Here the British hoped to hold for some time, but the 3/228th Regiment drove the 2/Royal Scots out of the Redoubt in a night attack. Among the reasons for the rapid Japanese penetration of the Redoubt was the wholly inadequate strength of the garrison resulting from the overall British shortage of manpower and the unaggressive patrolling undertaken by the British. As far as the latter was concerned, one patrol reported no enemy force in the area, despite the fact that it should have run directly into the Japanese advance. As a result, the British lost the opportunity to call artillery fire down on the Japanese assembly points. Then a company runner inadvertently locked the commander of the Shing Mun Redoubt into an observation post, disrupting the command structure. Finally, 18 of the Royal Scots’ men fell back, without orders, about 1 mile (1.6 km) to the south-east to join the 5/7th Rajput Regiment. As a result of these and other errors, the Redoubt fell in a little more than 12 hours, despite the fact that it had been expected to hold for one week. Sakai condemned the commander of the 3/228th Regiment for attacking outside his designated sector, and even went as far as to order the battalion to retreat from Shing Mun. The order was disobeyed, and only then, with some reluctance, did Sakai accept the reality of the situation. Sakai’s criticism prevented the 3/228th Battalion from undertaking a rapid exploitation of its success. With the aid of fire from the gunboat Cicala and a counterattack by the 5/7th Rajput Regiment, the Royal Scots were able to re-form their line along Golden Hill. The climb up the hill was tiring, however, and the position here was weak as they were only a few weapons pits on inadequate depth, no mines, and the barbed wire barriers had rusted toward disintegration. The Indian troops fought well, but were now discouraged by rumours that the 2/Royal Scots had abandoned the Shing Mung Redoubt in panic. The Scots were so stung by the inaccuracy of the rumour that they fought with great tenacity when the Japanese tried to force Golden Hill, and even went as far as to counterattack with great determination against considerably larger numbers after being forced to retreat from the position. The counterattack achieved a short-term success, but fresh Japanese troops soon took the position. Later on 13 December, the Japanese demanded that the British surrender, but were refused. The Japanese then started to bring up their heavy artillery, and Hong Kong was soon taken under a severe artillery and air bombardment. Maltby meanwhile reorganised his remaining strength into two brigades, the West and East Brigades, with responsibility for the corresponding halves of Victoria Island. The West Brigade had the 2/Royal Scots, 2/14th Punjab Regiment and Winnipeg Grenadiers, while the East Brigade comprised the 5/7th Rajput Regiment and the Royal Rifles of Canada. As the battle took place, the Kuomintang attempted to distract the Japanese with increased guerrilla activities and the movement of 1.5 divisions in the direction of Canton. Sakai responded by deploying one regimental group some 40 miles (65 km) to the north-east of Hong Kong, and the Chinese diversion accomplished little. However, the Kuomintang agents on Victoria Island proved very helpful at keeping order among the Chinese civilian population. The first Japanese attempt at a landing on 15 December was defeated, but this was in fact little more than a reconnaissance in strength by inferior troops. There followed by a second surrender demand on 17 December, and this too was refused. During the night of 17/18 December a small Japanese patrol crossed the harbour to undertake a reconnaissance of the Tai Koo Docks on the island’s north-east coast across from Devil’s Peak and just to the west of Lei Mun Passage. The patrol reported the positions of pillboxes and obstacles and noted that many of the pillboxes were unmanned, and Sakai therefore selected this area as the location of his planned major assault. The Japanese made their main landings on the night of 18 December in two waves, each comprising a single battalion of each of the 38th Division’s three regiments (228th, 229th and 230th Regiments), with the third battalion of each regiment in reserve. The Japanese rapidly secured a beachhead in the face of heavy machine gun fire and local counterattacks by Bren carriers, and began moving on their initial objective, the Wong Nei Chong Gap, whose seizure would sever the defence into halves. The commander of the West Brigade, Brigadier J. K. Lawson, had established his headquarters close to the Wong Nei Chong Gap in an area which was under heavy machine gun and mortar fire by 06.30 on 19 December. Lawson later came under criticism for leading so far forward, but his reasons for so doing will never be known as he was killed that day while attempting to extricate his headquarters. One company of the Winnipeg Grenadiers held out at the Wong Nei Chong Gap until 23 December, when its ammunition had been exhausted and it was surrendered by its chaplain, who the only remaining unwounded officer. With the Wong Nei Chong Gap in their hands, the Japanese were able to drive through the centre of Victoria Island, compressing the remnants of the British garrison forces in the western and southern ends of the island. The Japanese now started to advance along the north coast toward the city of Victoria. With the water supply cut, and fearing massive civilian casualties, Maltby surrendered on 25 December against the advice of his senior officers and the colony’s governor. Brigadier C. Wallis, commanding the remnants of the East Brigade at Stanley Fort, refused to obey the order until it was brought to him in writing in the early hours of 26 December. Maltby estimated his losses in the battle had been 2,113 men killed and missing and 1,332 men wounded. Many of the survivors were killed in the subsequent atrocities, and the remainder endured years of dreadful treatment as prisoners of war. The Japanese suffered at least 2,654 casualties. The battle was notable for the high degree of ‘fifth columnist’ activities and the atrocities which took place during and after the battle. There was considerable sniper activity on Victoria Island almost from the moment war broke out, and at least one Japanese officer was recognised by British prisoners of war as a barber who had worked in the British barracks. ‘Fifth columnists’ overran an important position on the Hong Kong shore of Lie Mun on the night of the main landings and helped guide the assault troops across the passage; some of these were captured with their signalling lamps and were summarily executed. A piece of 9.1-in (230-mm) artillery had been disassembled and its components smuggled into Kowloon before war broke out, after which it was surreptitiously assembled in a shed near the Kowloon golf course, where it had a clear field of fire. Atrocities committed by Japanese troops included the bayoneting of wounded men in captured British hospitals and the murder of many of their doctors and nurses. Prisoners were treated poorly, often being killed out of hand. One such massacre took place at a cliff on the north shore of Repulse Bay, where 54 prisoners were shot, bayoneted or beheaded. Nurses and other women were raped and murdered. Japanese commanders encouraged their troops to regard all local women as prostitutes and treat them accordingly. The rampage continued for two weeks after the capitulation, at which point discipline was suddenly and swiftly restored. 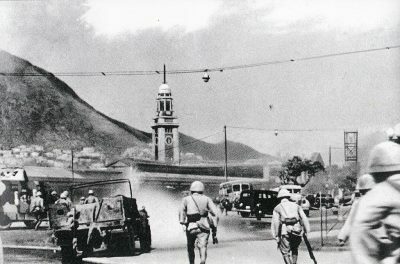 Hong Kong remained under Japanese control throughout the remainder of the war.